The Intel demo team at CES posing with some of the awards the Edison won. Computer vision is a processor-demanding task, but thanks to a dual-core Atom processor, the Intel Edison handles it with ease. The Edison ships with a highly custom Linux image, but you’ll only need to add a few software packages and custom code to get OpenCV — a wildly popular approach to computer vision — operational and recognizing human faces in photos. Follow the flashing instructions on the Intel documentation page at makezine.com/go/flashing-edison update your Edison with the latest image. And follow the setup prompts to configure a hostname and root password and to set up Wi-Fi access. On Windows, download and install Putty, an SSH client. Then point Putty to your Edison. NOTE: If you changed the hostname, replace edison in this address with the new name you created. Access to every package is not available without adding repository locations to the opkg/base-feeds.conf file. By doing this, you’ll add an enormous number of compiled applications, saving you the hassle of compiling from source. NOTE: Unofficial repositories are quite common across most Linux distributions. Next, install NumPy, OpenCV, and OpenCV-Python. That’s it! All the necessary packages are installed. Time to start hacking code! NOTE: Installing the basic text editor nano is not necessary, but is suggested unless you’re comfortable using vi. Download and place our sample photo in the Edison’s web server directory with the new filename, in.jpg. 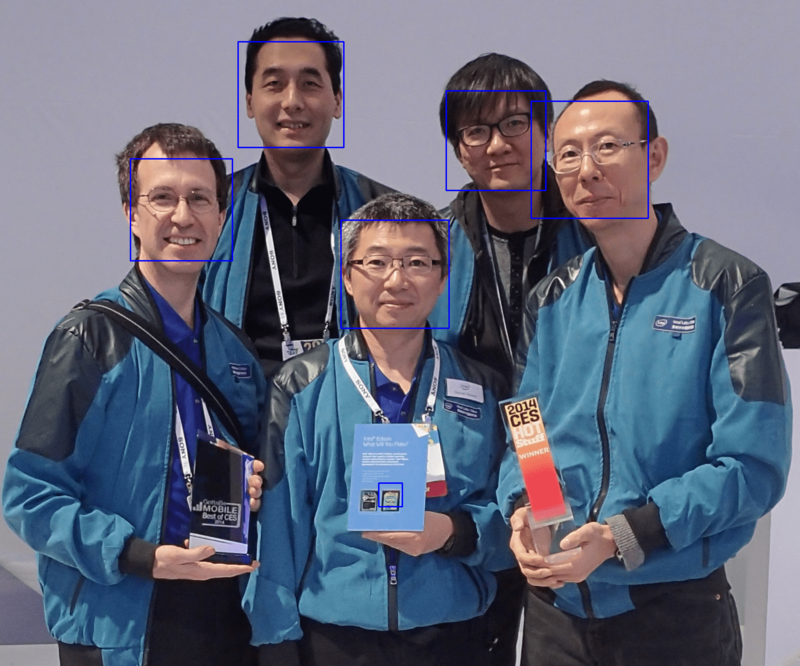 Next, download the XML file that defines the parameters for the OpenCV facial-recognition algorithm. This file is also saved to the public directory of the Edison’s web server as haarcascade_frontal face_alt.xml. Finally, save the text file by pressing Ctrl-X on your keyboard. When prompted to save the file, type Y and Enter. Download a simple HTML file which will display the pre- and post-processed images on the Edison’s onboard web server. Now head on over to http://edison.local/OpenCV.html to view the Before and After images, with a box around each detected face! Now that OpenCV and Python are configured on your Edison, be sure to see the official documentation for great example code and ideas at makezine.com/go/opencv-python-tutorials. OpenCV can detect all kinds of shapes, analyze video, and much more. is a research scientist with the Smart Device Innovation Team in Intel’s New Devices Group.